Vintage clothing is a generic term for garments originating from a previous era. The phrase is also used in connection with a retail outlet, e.g. in vintage clothing store. 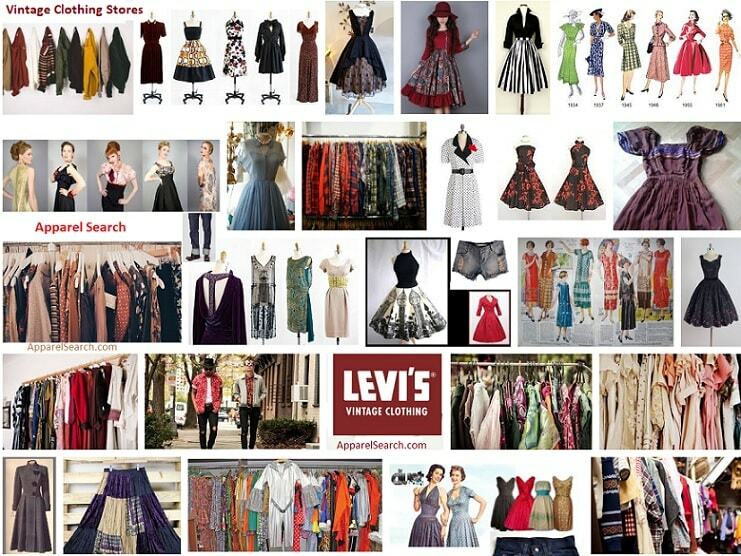 In addition to our vintage clothing store directory, you are welcome to search the Amazon database for vintage fashion . There can be debate over whether or not an item is vintage. Some vintage enthusiasts require an item to be at least twenty years old for it to be considered vintage (other stores less or more). As far as we know, there is no legal definition of the term to describe the exact number of years that must pass before a garment can become vintage. American Vintage Blues: Offers denim and dress designs for men and women. Also offers jewelry, sunglasses and purses. Angelica's Attic: Retro fashion, casual clothing and super-funky styles from the 50s through the 80s. Wanting to look like anything but the mall, you have found the place that will help you make your own fashion statement! Their prices can help you pull this off without drilling down the funds you have saved. Another Time Vintage Apparel: Apparel and accessories from the early Victorian era, through the 1950s for men, women, and children. Antique and Vintage Dress Gallery: Clothing featured from the 1800s through modern times including dresses, undergarments and accessories. Antiques To Cherish: Antique Victorian and Edwardian clothing and accessories for collectors. Also an assortment of buttons for collectors and fiber artists. Beaded and mesh purses, hair jewelry, perfume bottles and compacts. Axella's Vintage: Men's and women's clothing and accessories from the 40s to the 80s. Back-In-Style.com: find a unique collection of women's and men's vintage & designer clothing and accessories that you won't find anywhere else. They offer couture as current as this season and as old as the 1920 's because they believe the best way to wear vintage is to modernize your look by blending it with the contemporary styles. Black Light Vintage Clothing: Clothing, shoes and accessories from the 1970s for women and men. BobbyDene's Vintage Clothing: Specializing in Victorian, Edwardian, 1920s, 1930s time periods. Sells vintage dresses, wedding dresses, hats, shoes, boots, and lingerie. Bonnies's Treasures: Online sales of vintage clothing and accessories, Victorian era to disco. The terms vintage, retro, and antique are oftentimes used interchangeably. Retro (also known as vintage-inspired) refers to new objects that are designed to resemble other, genuinely vintage objects that are at least 15 years old or older. Vintage then refers to the original (old) objects the new designs are based on. Antique, on the other hand simply, refers to objects that are considerably older.